When I worked in an office, the ladies I worked with were intelligent, quick-witted and hilarious. Working with the public affords a level of comraderie difficult to come by in other workplaces. Not only did we commiserate about difficult customers or share knowing glances on crazy busy Friday afternoons, we also belly laughed over ridiculous inside jokes. One of these inside jokes revolved around our mutual love of specific foods and snacks. If something was stop-you-in-your-tracks delicious, we’d say, “Oh my gosh, this is so good I could swim in a vat of this and eat my way out!” Think of the scene in Patch Adams where they honor the patient’s wish to swim in a pool of noodles. Making a new recipe tonight for a Mexican Quinoa Bowl, the dressing caught my eye. Avocados, tomatillos, garlic, cilantro…glancing through the ingredient list I realized I had most items already on hand. After the last few meh and outright failure dinners, I was looking for something to wow the taste buds. Looks kind of like baby-poo green, but oh, my. SO DANG Good! Pop it all in the blender and voila! Instant yummy! The recipe called for refrigeration to let the flavors meld, and then to assemble the remaining parts of the bowl. 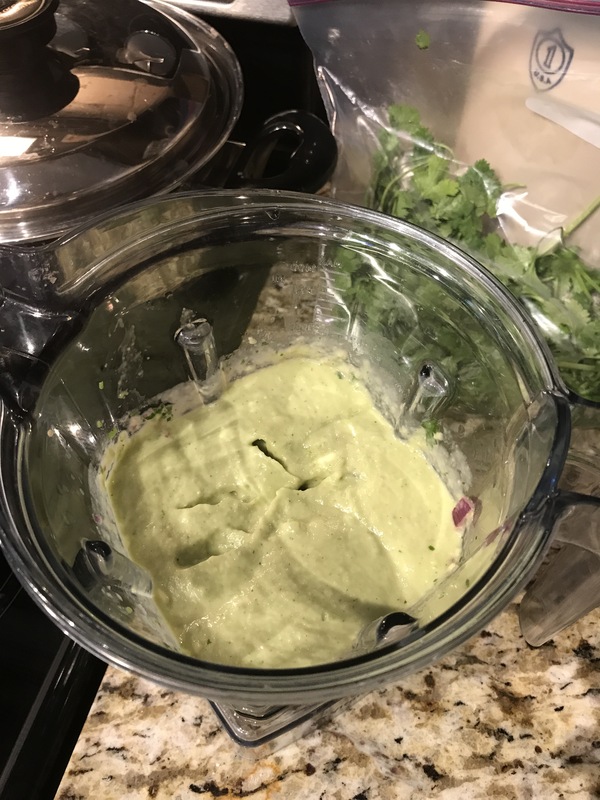 I dipped tortilla chips in to taste test and it was all I could do to not crawl in my blender and lick it clean! Tomatillos! Where have you been all of my life?! 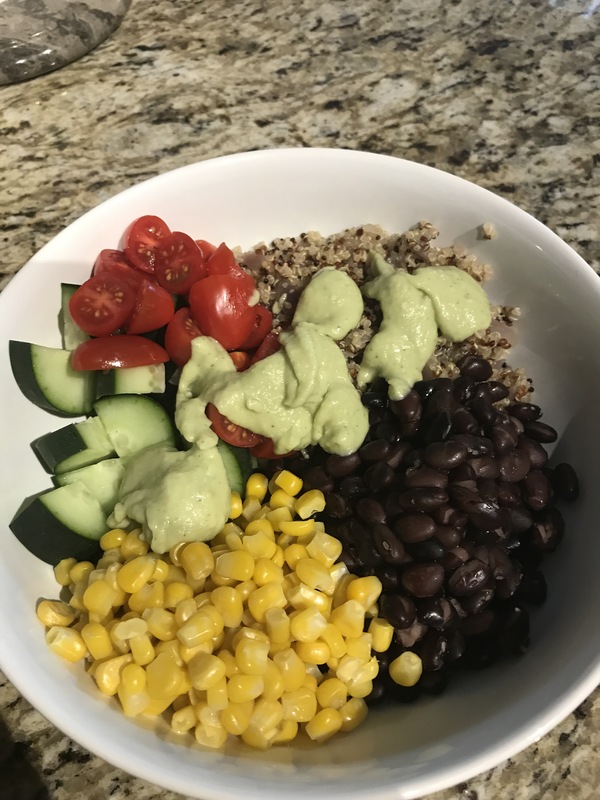 The rest of the bowl came together very quickly; tri color quinoa, diced cherry tomatoes, diced cucumbers, black beans, and corn. Top it all off with the avocado salsa and enjoy! Next time I may place this on a bed of mixed greens and add some sautéed peppers and onions. After making disgusting bean burgers and so-so stirfrys, I was so excited to tell Eric that I made something vat-worthy!